The son of a Scottish Liberal MP, Raymond Egerton Harry Watt was born in Edinburgh on 18 October 1906. He studied at Edinburgh University, but failed to complete his degree. After a spell in the Merchant Navy and a number of short-lived industrial jobs, he joined John Grierson at the Empire Marketing Board Film Unit in 1932. While learning the basics of film-making with Grierson in London, Watt also gained valuable experience assisting John Taylor on Robert Flaherty 's film Man of Aran (1934), on location in Ireland. 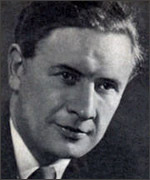 In 1936, on Grierson's recommendation, he became a director for the newly-established London unit of the American newsreel series March of Time ; his most notable assignment, England's Tithe War (1936), reported on a bitter dispute in Suffolk between tenant farmers and the Church of England over rent collection. For the GPO Film Unit , Watt went on to direct most of Night Mail , best-remembered of all the 1930s documentaries, where W.H Auden 's poetry and Benjamin Britten 's music helped make the night-time journey from London to Glasgow evocative and exciting. In 1937 Alberto Cavalcanti succeeded Grierson as the Unit's head. Cavalcanti had directed commercial feature films, and under his tutelage Watt developed a unique form of story documentary. In The Saving of Bill Blewett (1936) and North Sea (1938), soundtrack commentary was abandoned: necessary points were funnelled instead into simple, realistic stories structured from ordinary events, peopled entirely by non-actors. With Bill Blewitt , the story about a fisherman resourceful enough to buy his own boat from his post office savings pales beside fascinating details of life in the mid 1930s in the Cornish fishing village of Mousehole. North Sea , reconstructing the rescue of an Aberdeen trawler through the use of ship-to-shore radio, proved much more dramatic, and established a template for the great story documentaries of the Second World War. Together with Cavalcanti and Humphrey Jennings , Watt was the mainstay of the GPO Film Unit at the outbreak of war. With Jennings and Pat Jackson he was responsible for The First Days (1939), important in setting the tone of stoic restraint that was to characterise British propaganda; he also handled interior scenes on London Can Take It! (1940), the vivid and influential record of the Blitz, co-directed with Jennings. When Ian Dalrymple succeeded Cavalcanti at what became the Crown Film Unit , Watt was able to persuade his new boss to mount a fifty-minute story documentary about a British bombing raid over Germany. Powerful and gritty, Target for To-night (1941) was the first British documentary to reach a wide audience in commercial cinemas. Its success was such that RKO asked Watt to make a similar film about Americans serving with the RAF in the 'Eagle Squadron', but high casualties made such an ambitious project a dangerous proposition. Instead Watt moved to Ealing , where Cavalcanti was attempting to marry fiction with documentary realism. Watt's Nine Men (1941), a fictional but highly authentic account of the remnants of a British platoon holding out in a desert fort (actually in Wales), exemplified the new ethos. After collaborating on the script for Charles Crichton 's For Those in Peril , a sober dramatic account of the Air-Sea Rescue service, Watt tried to move into a different area, directing and co-writing Fiddlers Three , a musical comedy with Tommy Trinder and two mates transported in time back to Nero's Rome. It was not a happy experiment, and he only found his feet again with The Overlanders (1946), where he successfully dramatised the story of Australian farmers migrating across the country to escape the threat of Japanese invasion. Ealing sent him back to Australia to make Eureka Stockade (1949), the story of a mid nineteenth-century insurrection in the Australian goldfields, planned by Watt as the first of a series, shot in different Commonwealth countries, reflecting the birth of democracy. This tough struggle for social justice was a tale after Watt's own heart, but it exposed his weakness in sustaining narrative tension in a long and complex story. Though the democracy theme was abandoned, Watt's Commonwealth travels continued with two African sagas, Where No Vultures Fly (1951) and West of Zanzibar (1954): both stronger films, dramatically. Watt's fine eye for realist detail was applied to stirring stories about a well-intentioned white game-warden (the square-jawed Anthony Steel ) protecting the great beasts of East Africa's jungle from nefarious poachers. Though now rarely shown, the films were tremendously popular with British and colonial audiences and became two of Ealing's biggest box-office successes. For a brief spell in 1955/6, Watt worked as a producer for Granada Television , presenting a wildlife programme. But he rejoined Ealing and returned to Australia in 1958 for what became the studio's final feature, The Siege of Pinchgut , an effective location-shot drama about three escaped convicts making a last stand on a tiny island in Sydney Harbour. Glossier and more assured than Nine Men , it still harked back to the same documentary realist ethos. His last cinema films, two minor ventures made in Norway and Denmark, emerged in 1961. Watt's was a modest talent, but one he deployed knowledgably and effectively. With his documentaries, it may be difficult to disentangle his contribution to Night Mail from Basil Wright 's (responsible for bringing in Britten and Auden ), or to determine whether he or Jennings deserves most credit for London Can Take It! . But the direct impact and urgency of North Sea and Target for To-night are distinctive; and though not all of his Ealing features found the ideal balance between story and theme, fiction and reality, he still achieved greater lasting success in the feature industry than most other British documentary directors. Harry Watt died in Amersham, Buckinghamshire on 2 April 1987.